The Aurigids performed very close to predictions, it seemed, with quite a few bright meteors, ramping up in number toward the predicted peak time then dropping off very rapidly to almost zero at or shortly after the predicted peak of 5:36 am MDT. This was the brightest Aurigid, captured during my pre-dawn session, caught by two difference cameras and lenses. This one left a train that persisted for about a minute as it dispersed in the high-altitude winds. In New Mexico, amateur radio astronomer Thomas Ashcraft operates an 83 MHz forward scatter meteor radar. His system records echoes of distant radio stations from the hot trails of disintegrating meteoroids; "I have merged my forward scatter array with an all-sky camera and am now capturing fireballs with sound," says Ashcraft. I observed the shower from the roof of my house in suburban Tucson AZ. From 3:30 am to 5:00 am I observed 42 meteors. Corrected for things such as my ability only to monitor half the sky, moonlight and light pollution, altitude of the radiant, etc - I estimate the ZHR at ~95. Not bad for a rare event like this. 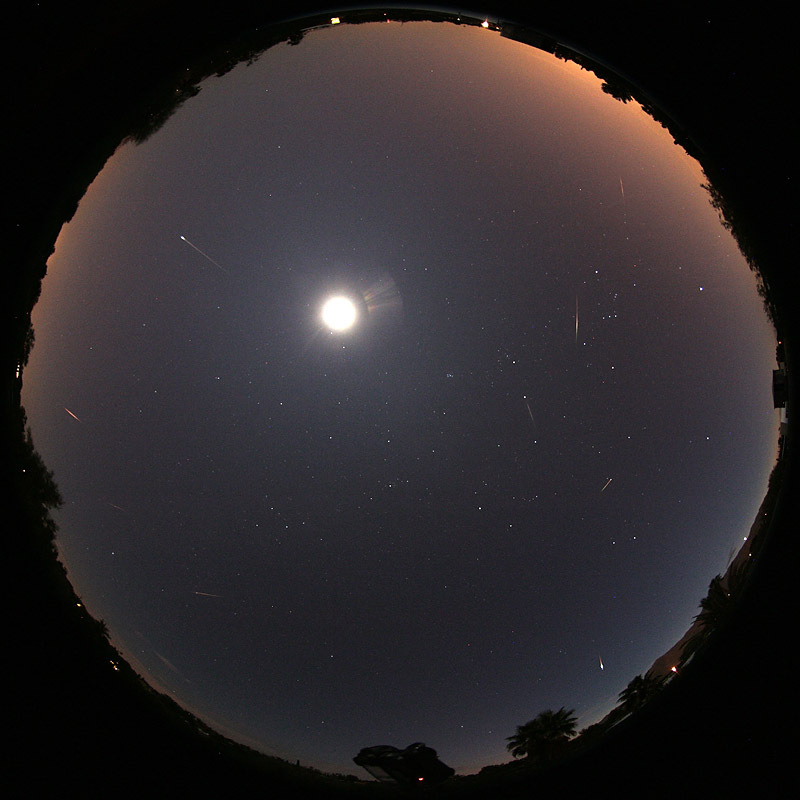 Most of the meteors observed were very bright (> 2.0 mag) and made for a brilliant show. The peak was due at around 4:36am local time but visual observation suggest that this peak occurred earlier then expected (~4:25 am). 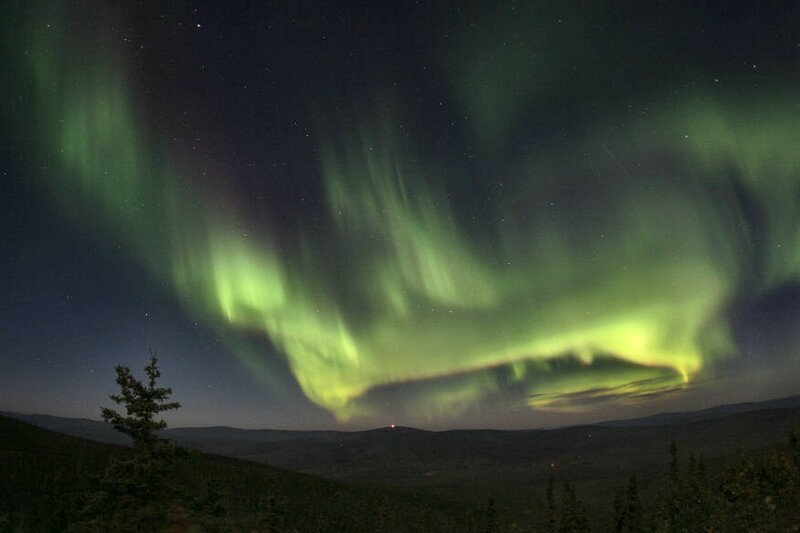 As promised, the Augrids arrived last night after a stellar display of northern lights. I saw about 40 or 50 meteors over the span of an hour but could only photograph a handful. I saw one bright fireball. It had to be bright to overcome the light pollution here in the Dallas/Fort Worth Metroplex! The meteor radio echoes were non-stop. I recorded audio from two receivers simultaneously. One receiver was on 216.979 MHz, and the seccond was on 61.239 MHz. "Exactly where do I aim my camera?" Never found a good answer, other than somewher a little away from Auriga. 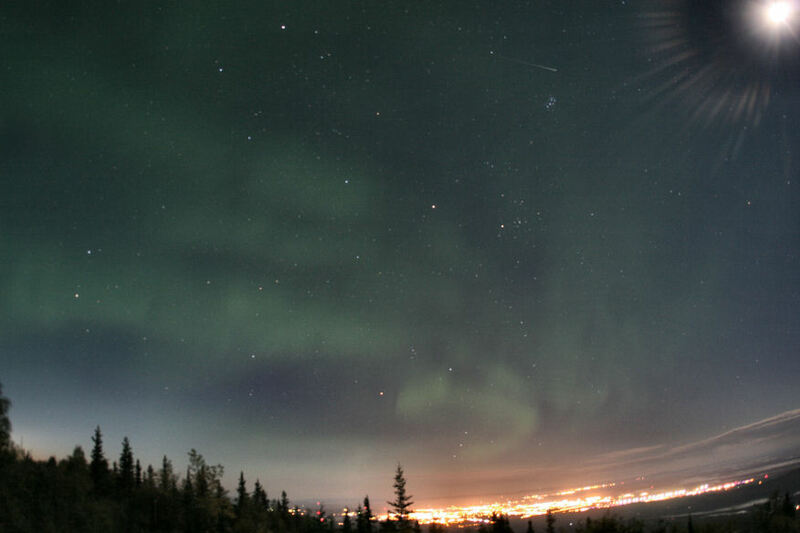 I took 72 pictures with my DSLR but only one caught two Aurigids. The irritating thing was that almost invariably an Aurigid would show between shots when the camera was processing the image, which was as long as the exposure time, which I had set at 10 sec at first and then changed it to 15 sec, hoping that I'd have more time to catch one, but of course also more time to loose some while the processing was going on... can't win! But it definitely was one of the better showers I have seen! I was amazed at how they stopped coming, like someone had turnef off the faucet! 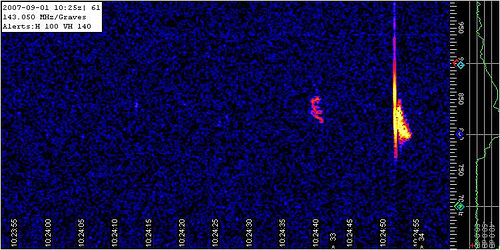 The Aurigid meteor shower as recorded by my radio meteor detection system in Devon, SW United Kingdom. Very nice display in spite of Moon. This is a composite of 2 exposures 120 seconds each. Photo details: Canon Rebel XTi camera ISO 400, Sigma 15mm f/2.8 DG fisheye lens at f/4. Kenko Skymemo mount was used for tracking. 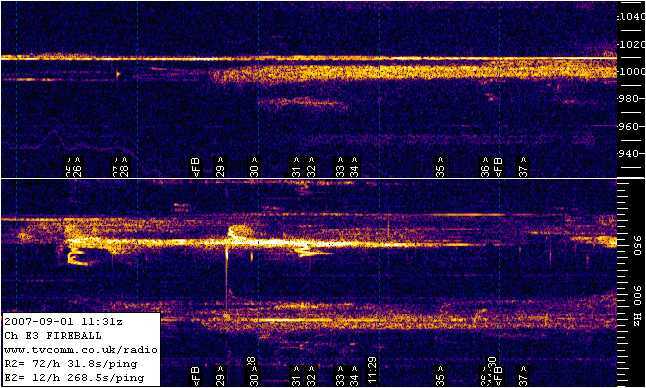 from Dave Olean (K1WHS): "I live on the US East Coast, so viewing the meteor storm on September 1 was not a possibility, but a number of radio amateurs, (myself included) were up trying to bounce VHF radio signals off the ionized meteor trails. The shower was very good here from before 1100 UT to almost 1200 UT. I would guess the shower peaked about 1120 UT from the sound of things. 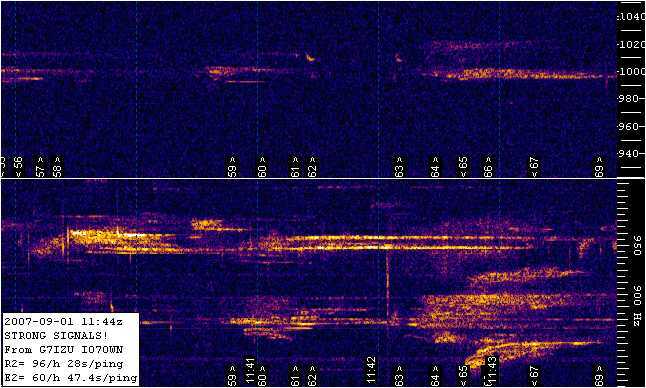 On 50 MHz the meteor trails made for almost 100% reflections. The signals had rapid fading which distinguished the propagation as meteor induced. On 144 MHz the ionization was quite good as well. The bursts were of shorter duration, but I had no trouble contacting many stations from Florida to Illinois. I did not make any detailed survey of meteor numbers, but from the sound of things I would estimate the meteors were arriving at about 200-400 per hour for a short time. It sure made for an interesting morning. My best contact was 1460 miles to Kansas from my home here in Maine. I sure am sorry that it was daylight here. It must have been a great show!" from Debra Wirkman of Santa Cruz, California: "Had a great view from here in Santa Cruz. I was lucky -- the fog parted just in time for me to see that bright white streak across Orion that someone else from CA already mentioned, which was way cool. Even cooler was a series of several good-sized green meteors in the eastern sky that looked like one that had broken up into chunks. 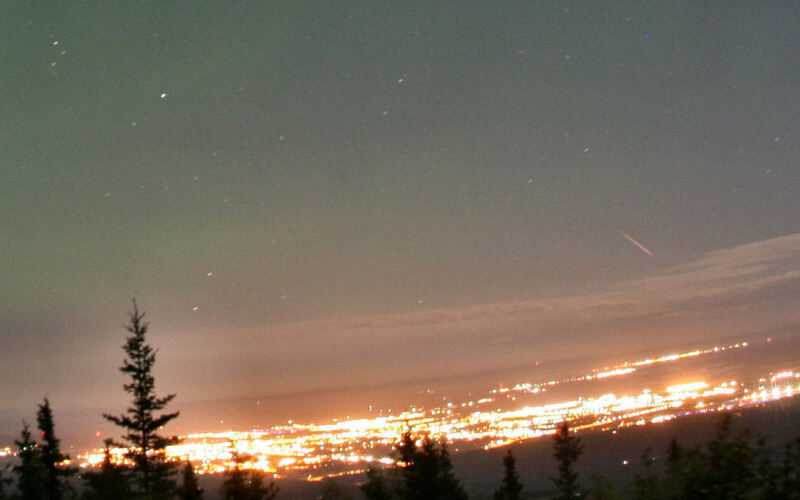 I had never seen green meteors before last night. I saw a few other green ones and saw a very bright yellow one too. All together I guess I saw about 7-10 bright meteors and maybe 30+ total, watching intermittently between 3:30 and 4:45. Thanks for letting me know about this meteor shower, it was special!" from Kevin McKeown observing from 15 miles northwest of Albuquerque, New Mexico: "I set up under good skies despite the Moon. My first Aurigid occurred at 4:36 AM MDT, and for the next hour, I counted 30 Aurigids, and 1 sporadic. 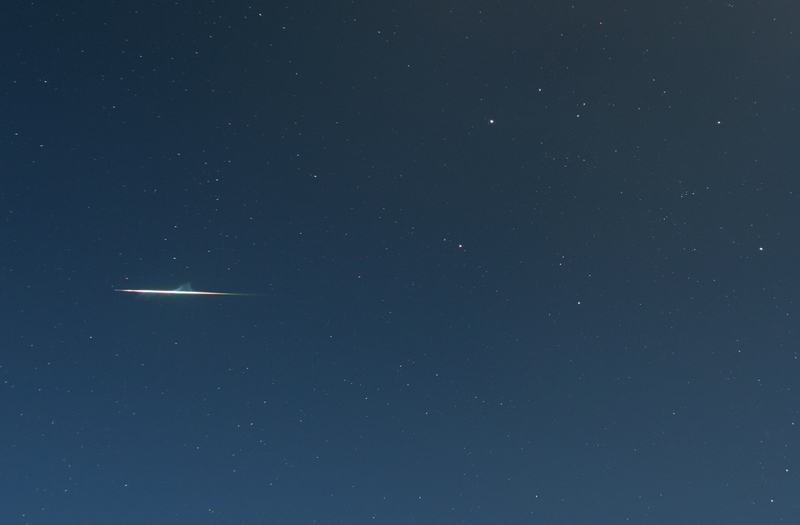 Most of the Aurigids were bright, lovely meteors. At least 4 were Sirius bright or brighter. I would guess the peak occurred near 5:00 to 5:05 AM MDT for me. By 5:17 AM things seemed to be over. The last, at 4:36 AM MDT, was a -6 or -7 blast that left a train for maybe 15 seconds. In dark skies this object would have been magnificent, with a long lived train. One aspect of the shower that at least seemed obvious to me was the highly diffuse radiant. Can anyone else comment on this? The great photos seem to bear this out. Overall this shower was better than the Perseids." from Brian Martin of Ontario, California: "At about 3:00 PDT, my fiance and I arrived just 3 miles west of the Cajon Junction in California near Devore. As the time past, I saw my first bright on to the North about the magnitude of the star Sirius at around 3:30am PDT. After that, close to about 3:45am PDT, me and the group I met up with saw 3 at the same time coming from the radiant of shower. 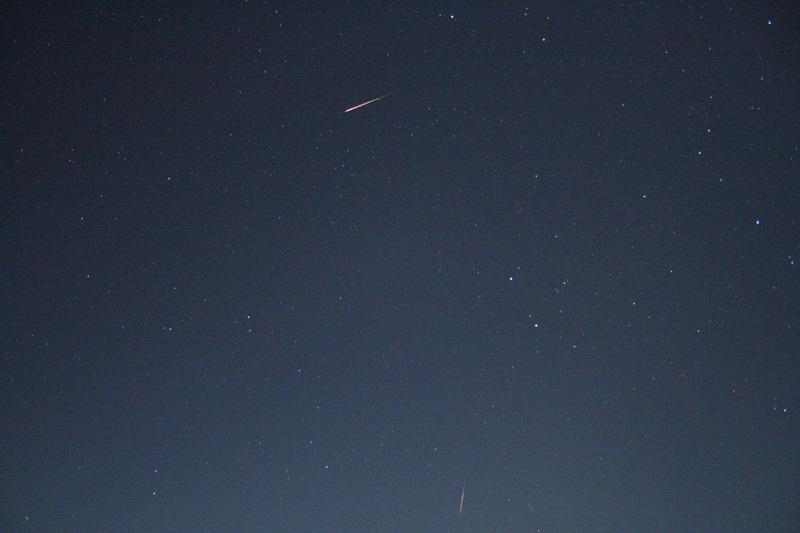 The three were extremely bright as well, I am going to say Vega brightness. 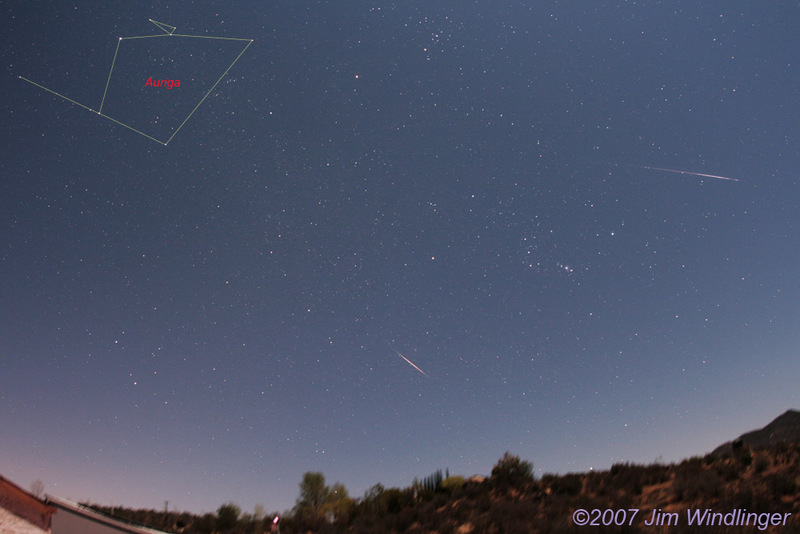 Then around 4:00am PDT, we started to see bursts of meteors, maybe 20-25 in about 10-15 minute intervals. 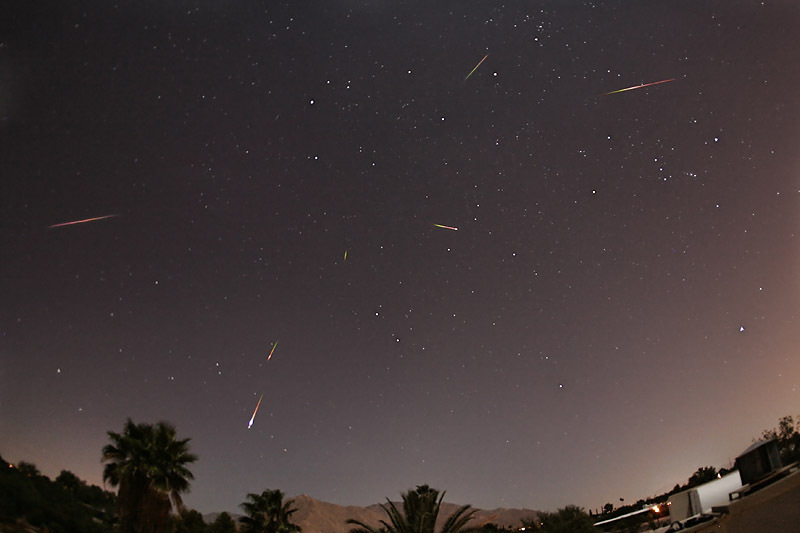 Most of the meteors were very bright. On average, I'd say most of these were -1 to - 2 magnitude. Several left trails (meteor trains) that lasted for seconds! Brightest one of the night was as bright as Venus. To me, the show started at 3:30 PDT officially and ending around 4:30 PDT. No joke. After around 4:30 PDT, we saw no more." other in Eridanus and Canis Major respectively." 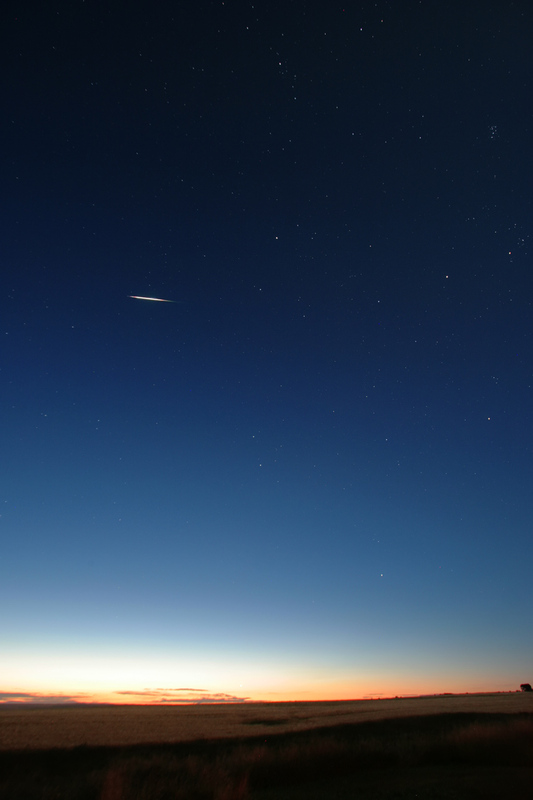 from Janine Johnson in the Sierra foothills near Lagrange, California: "I watched from 3:30 AM until 4:45AM (at which time they seemed to wane -at least in the direction I was looking: up and to the northeast), and saw 31 large meteors during that time, and four possibles, which could have been tricks of my eyes, so I didn't count them. A great display! There were two nearly simultaneous big ones, also. Orangy-yellow, as predicted. My location was in the Sierra foothills near La Grange CA, latitude N37º 39' 5", longitude W120º 20' 52". The moon was indeed a pain. I wore a baseball cap. I'm glad they made an appearance!"